Maria Assunta Iovine first appears at Painesville, Lake County, Ohio, in 1909. When Maira Assunta immigrated to the United States, Painesville, Ohio, was her destination. 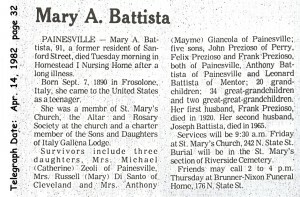 In America, Maria Assunta Iovine was known by her married name, Mary Prezioso, then after second marriage, Mary A. Battista. Maria Assunta Iovine, daughter of Leonardo Antonio Iovine and Domenica DiCristofaro, was born on Saturday, October 24, 1896, at Frosolone, Isernia Province, Molise, Italy. She married Francesco Preziuso, son of Giovanni Antonio Preziuso and Caterina Mainella, on October 10, 1909, at St. Mary Catholic Church at Painesville, Lake County, Ohio. Maria was widowed by the death of Francesco Preziuso on May 21, 1920. Maria married second, Giuseppe Antonio Battista, son of Giovanni Battista and Angelina Petti, on February 13, 1923, at St. Mary Catholic Church, Painesville, Lake County, Ohio. 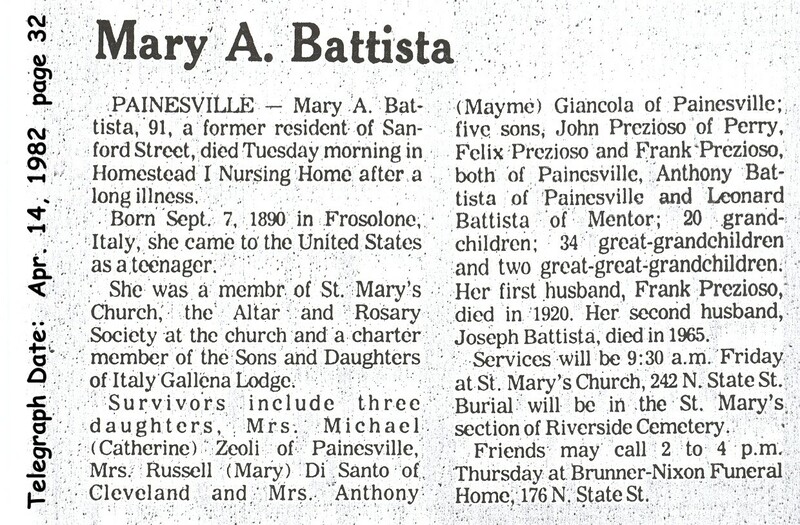 Maria Assunta died on April 13, 1982, at Homestead I Nursing Home, Painesville, Lake County, Ohio, at age 85. Her body was interred at Riverside Cemetery at Painesville, Lake County, Ohio. Maria Assunta Iovine, age 13, immigrated to the United States on September 20, 1909, travelling to Painesville, Lake County, Ohio, to join her father, Leonardo Iovine. Maria was travelling with her uncle, Cristofaro DiCristofaro, and her cousin, Nicola DiCristofaro. Cristofaro. They were travelling to Painesville. Maria’s brother, Angelo Iovine, had immigrated in March, 1909. Maria Assunta Iovine became a citizen of the United States on 1916. Maria Assunta Iovine’s mother, Domenica DiCristofaro never left Italy. However, four of Domenica’s siblings did. Maria Assunta was related by blood to the Colavecchio, DiCristofaro, and Cardegna families of Painesville. 1. Catherine Preziuso was born on October 20, 1910, at Painesville, Lake County, Ohio. She married Michael B. Zeoli on June 10, 1939, at St. Mary Catholic Church, Painesville, Lake County, Ohio. Catherine died on February 28, 2003, at Hospice House, Cleveland, Cuyahoga County, Ohio, at age 92. Her body was interred at All Souls Cemetery at Chardon Township, Geauga County, Ohio. 2. Mary A. Preziuso was born on April 28, 1912, at Painesville, Lake County, Ohio. She married Russell DiSanto on June 9, 1934 at St. Mary Catholic Church, Painesville, Lake County, Ohio. Mary died on March 16, 2003, at Strongsville, Cuyahoga County, Ohio, at age 90. Her body was interred at Holy Cross Cemetery at Cleveland, Cuyahoga County, Ohio. Mary lived in Cleveland, Ohio, from 1934 until her death. 3. Mayme M. Preziuso was born on January 19, 1914, at Painesville, Lake County, Ohio. She married Olimpio Antonio Giancola, son of Giulio Giancola and Bettina Izzi. Mayme died on February 20, 2006, at her home, Painesville, Lake County, Ohio, at age 92. Her body was interred at St. Mary Cemetery at Painesville Township, Lake County, Ohio. 4. John J. Preziuso was born on December 23, 1915, at Painesville, Lake County, Ohio. He married Philomena Square, daughter of Giuseppe Scacciavillani and Anna Antonia Cardegna, on June 12, 1941 at Saint Mary Catholic Church at Painesville, Lake County, Ohio. John died on November 19, 1985 at Eustic, Lake County, Florida, at age 69. 5. Felix P. Preziuso was born on March 26, 1918, at Ohio. He married Helen M. Cawley, daughter of John and Josephine Cawley. Felix died on May 22, 1992, at age 74. 6. Frank James Preziuso was born on December 27, 1920, at Painesville, Lake County, Ohio. Frank died on August 25, 2000, at Lake County, Ohio, at age 79. His body was interred at Riverside Cemetery at Painesville, Lake County, Ohio. 1. Anthony J. Battista was born on January 9, 1924. He married Eleanor A. Sabolik, daughter of Michael Sabolik and Anna Titka, on September 28, 1946 at Lake County, Ohio. 2. Leonard F. Battista was born on November 16, 1925. He married Irene M. Shula, daughter of Daniel Shula and Mary Miller, on June 28, 1947 at St Mary Catholic Church, Painesville, Lake County, Ohio.